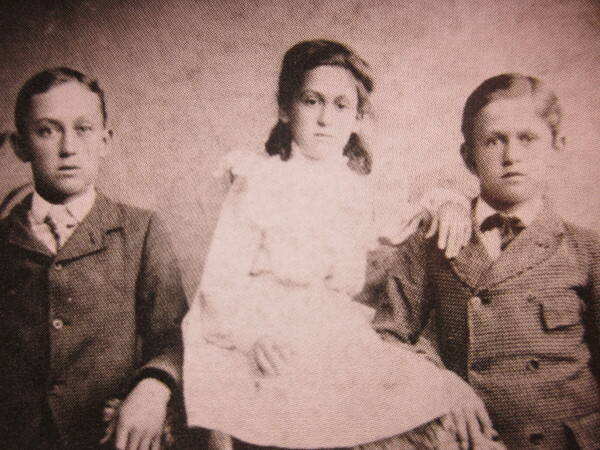 The W. H. Cobb family in the 1890s were very young, strong, vibrant intellectual and very full and active in cultural and societal endeavors in the communities where they lived. Mr. Cobb was fluent in all aspects of political and civic affairs in the immediate area. Mrs. Cobb was very active in the ladies' social arena and enjoyed trips to Atlanta to visit and endulge in shopping adventures. The three children was normal and spent their days going to school and playing with the neighborhood children about town and during summer months would look forward to trips to see their grandparents of both sides. Mr. Cobb's parents lived over the state line in North Carolina and Mrs. Cobb's parents live 20 miles away over in Banks County near Baldwin, Georgia. 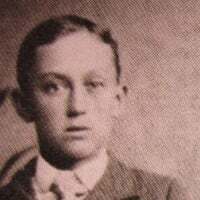 "He always had a bat in his hands when he was a youngster and my most vivid impression of his youthful days is seeing him coming home from school swinging a bat at an imaginary ball as he walked along,"
"Cobb was always a fine, clean chap, who loved baseball. We never dreamed that we had the great star of baseball in our midst. But we are proud of the boy and if you want to get a scrap out of the mildest-mannered man in town, just say something about Cobb." "All my efforts shall be exerted towards harmony among our people. 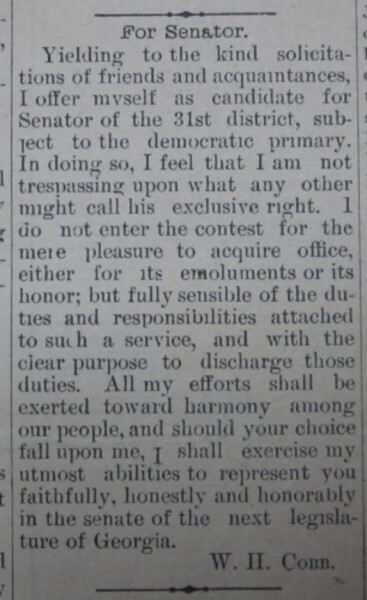 Should your choice fall upon me, I shall exercise my utmost ability to represent you faithfully, honestly and honorably in the Senate of the next legislature of Georgia." On June 11th, 1892, Professor W. H. Cobb, father of Tyrus Cobb, graduated from North Georgia Agriculture College in Dahlonega, Georgia. Young Tyrus was only five years old and was in attendance but slept through the ceremony. His father graduated with first honors. Captain Caleb Chitwood was elected to the Georgia House of Representatives. How to play baseball was released in 1892 when young Tyrus Cobb was only 5 years old. Professor Cobb took charge of the school at Harmony Grove, now known as Commerce, Georgia. Senator W. H. Cobb gave a very convincing presentation before the Georgia senate to urge them to give an even $1,000,000 to education in Georgia. The bill and amendment passed after Senator Cobb's persuasive speech. Profession W. H. Cobb passes his examination to get his teaching license will a principal at Royston School. Professor W. H. Cobb, County School Commissioner of Franklin, was elected V.P. of the Northeast Georgia Oratorical Association. Senator W. H. Cobb Investi-gates Academy in Macon. Senator W. H. Cobb is chairman of a committee appointed to investigate misuse of government funding for the Academy for the Blind in Macon, Georgia. State School Commissioner Pays High Tribute W. H. Cobb. State School Commissioner, Merritt, pays high tribute after the death of Professor W. H. Cobb of Royston in Franklin County, Georgia. "I should not have hesitated to pronounce that he is one of the very best County School commis-sioners in the state of Georgia," says Merritt.